The U.S. Centers for Disease Control reports dramatic increases in the number of people diagnosed with autism or developmental disorders over the past 15 years. For related story, click here. Also on the rise is the number of preterm births in the U.S. and across the globe. Medical advances have kept more preterm babies alive but also increased the number of American families struggling to cope with disabilities. Premature birth is the leading cause of neurological disabilities in children, according to the National Institute of Child Health and Human Development. Researchers are studying causes with an eye toward prevention, but experts say a primary focus should be on providing help for those with cognitive disabilities and physical limitations. United Methodist churches across Florida have set up ministries to do just that, and veterans of special needs ministries say the time is ripe to expand on this outreach. "What I know is that Jesus loves me and what I know is that He loves me all year long. Jesus gave us the free gift of eternal life and that's His promise, and I want to give and what would Jesus do if we all would give more and what if we would give to them who do not have a job, who do not have a house, and if I had an extra room, I would give them something." Friends Ministry at Southside UMC, Jacksonville: Founded in the 1970s, this ministry focuses on adults with cognitive impairments, inviting them to participate in the Sunday contemporary service and offering a special Sunday school class. Members also sing in a choir, take field trips and participate in service projects around the church and in the community, said Chris Harrill, who oversees the ministry with her husband, David. Currently, Friends is serving about 35 people ages 25 to 70. "Some live in group homes, some independently or with other mentally challenged adults," Harrill said. "Three members of the class, their families go to our church." Others hear about the ministry and arrange transportation. Southside volunteers take turns driving the church bus to pick up many in the immediate area. During the contemporary service, where Friends participants blend with other worshipers, about four or five volunteers are on hand to help. Harrill said she and her husband prevent most problems with preparation. "Our class has learned there is a certain decorum [expected], and we go over church manners in our curriculum," she said. She said some people make Southside their church home because they like how the congregation includes worshipers with special needs in mainstream activities. Others sometimes seem uncomfortable, but after years of building the ministry, those occasions are few. "It just takes a nice conversation to kind of educate people," Harrill said. Trinity UMC, Gainesville: The congregation at Trinity UMC believes strongly that people with disabilities should be "mainstreamed" with other worshipers as much as possible, said Dr. Dan Johnson, senior pastor. He estimated the congregation includes about 30 people with various disabilities, including one young adult with severe autism that likes to hold a guitar and join the praise band on Sundays. "It's a big part of his life," Johnson said. Once a month, there's a disability awareness service in which church leaders review proper etiquette in addressing disabled worshipers and encourage members to think of ways to involve everyone in the life of the church, Johnson said. The congregation has incorporated accessibility features into a new outdoor facility it's building, including picnic tables with concrete slabs that allow wheelchairs to roll up to the table. Underway is a campaign to raise $3,000 for improvements, including a platform swing that can accommodate a wheelchair. The importance of disability awareness was brought home to Johnson in 2001, when his daughter, then 22, was hit by a drunk driver and fell into a coma. Johnson said he is grateful that she survived and recovered most of her abilities, but her speech and balance were permanently affected. "That sort of catapulted me into a strong leadership role for this ministry," the pastor said. Welcoming people with disabilities offers churchgoers a chance to mature by learning about the challenges of others, Johnson said. "All of us have a disability, or will," he said. "So we all benefit." The Special Gathering: First UMC, Melbourne, is one of many churches on the east coast of Florida to take advantage of programs planned by The Special Gathering, an ecumenical ministry that offers worship opportunities and advocacy for the mentally challenged. 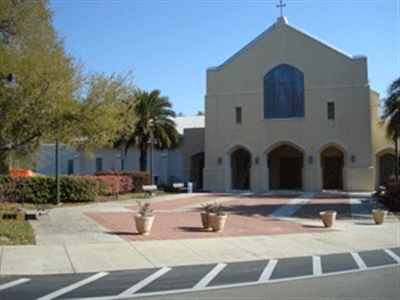 The Melbourne church hosts a worship service for Special Gathering members each Sunday. With assistance, the members operate as their own congregation, running their own choir and worship programs and taking up offerings. Appointed elders fill in to administer sacraments. Typically the First Melbourne service attracts about 60 worshipers, said Linda Howard, the ministry's director for the Indian River area. Also operating under the auspices of The Special Gathering are groups in Titusville, Cocoa, Vero Beach, Daytona Beach, DeLand and Jacksonville. Including a group that has formed in South Carolina, the ministry estimates its membership at about 400. The ministry focuses on intellectually challenged adults, filling a void that often occurs when special needs children outgrow public school programs. "After high school, there's a loneliness that sets in and they want to be with their peers," Howard said. The program encourages opportunities for Special Gathering participants to mingle with the congregation at large, and First Melbourne has been particularly gracious in including the ministry in church activities, Howard said. The services, however, are tailored to the membership's special needs. "We believe the church needs the gifts of our members, but they [members] also need to hear the message at a level they can understand," Howard said. "They need to be treated as adults … but they learn at the third- to fifth-grade level." The ministry helps coordinate transportation and can advocate for members trying to get or retain state services, though the program is not a social service agency, Howard said. "Our primary purpose … is leading them to a personal relationship with Jesus and then discipling them." * Susan Green is the editor of the Florida Conference Connection.